Astrophysicists Mattia Galiazzo and Rudolf Dvorak from the University of Vienna, in collaboration with Elizabeth A. Silber (Brown University, U.S.) investigated the long-term path development of centaurs, solar system minor bodies that originally have orbits between Jupiter and Neptune. The researchers have estimated the number of close encounters and impacts with the terrestrial planets after the so-called Late Heavy Bombardment about 3.8 billion years ago, as well as the possible sizes of craters that occur after a collision with the Earth and the other terrestrial planets. The report is published in Monthly Notices of the Royal Astronomical Society. Centaurs originate mainly from the trans-Neptunian objects, and are among the sources of near-Earth objects. Thus, it is crucial to understand their orbital evolution, which in some cases might lead to collision with terrestrial planets and produce catastrophic events. The researchers studied the orbital evolution of the centaurs toward the inner solar system, and estimated the number of close encounters and impacts with the terrestrial planets after the Late Heavy Bombardment, assuming a steady state population of centaurs. "We also estimate the possible crater sizes. Centaurs can also become active comets, because of the presence of water on a good number of them. Thus, we also computed the approximate amount of water released to the Earth, which is comparable to the amount of water present in the Adriatic sea today. We also found subregions of the centaurs where the possible impactors originate from," explains Mattia Galiazzo. Crater sizes could extend up to hundreds of kilometers in diameter; however, given the known population of centaurs, the majority of the craters would be less than ~10 km. For all the planets and an average impactor size of ~12 km in diameter, the researchers estimate on average two impacts since the Late Heavy Bombardment for the Earth, and between one and two for Venus. 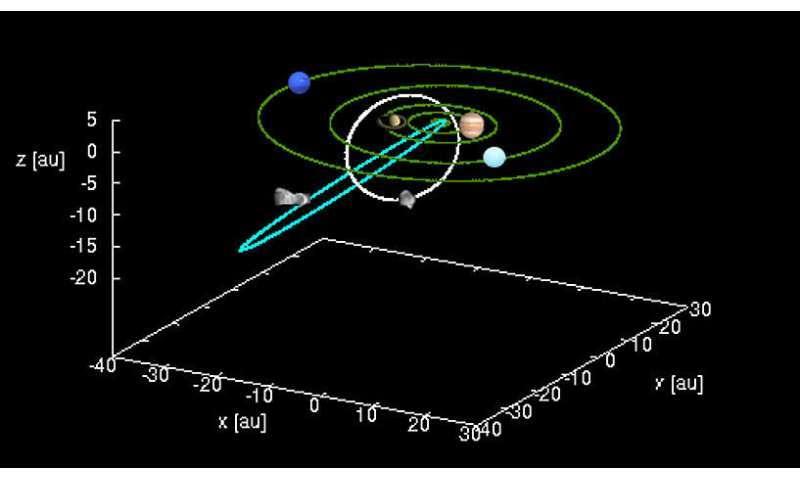 This "bombardment" is less intense (of at least one-tenth) than the impacts of asteroids originating between Mars and Jupiter. However, centaurs are on average much faster and more massive. For smaller centaurs (e.g. with a diameter > 1 km), the impact frequency is much higher, about one every 14 Myr for the Earth, 13 Myr for Venus and 46 for Mars. The researchers find that about half of the centaurs can enter into the terrestrial planet region and ~7 percent of them interact with terrestrial planets. Centaurs could be the cause of past catastrophic events on Earth. These results provide an important contribution in the analysis of catastrophic events of extraterrestrial origin, which also occur on planets like Mars and Venus. "Our work also provides the framework for better understanding past events, and how they might had altered life on Earth and other terrestrial planets," says Galiazzo. For example, Dvorak says: "Such events could have a direct impact on life by either destroying it (e.g. Earth) or creating conducive conditions (e.g. hydrothermal activity) for new life to form. 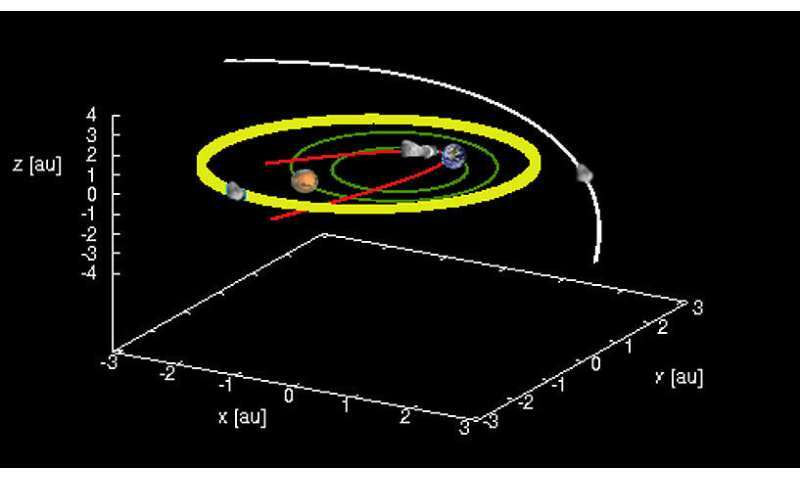 In addition, our results offer more answers on the evolution of the present solar system." Silber also notes that Centaurs could deliver water to Mars via collision; recent missions confirm the presence of water on Mars. "For smaller centaurs (e.g. with a diameter > 1 km), the impact frequency is much higher". This of course means that a centaur with a diameter of 10 km (diameter is > 1 km) will have a higher impact frequency than centaurs with a diameter of 10 km. Probably a student translating for English publication. Might not have even been a Science Major? Simply did not understand the source material. Or dare make any corrections to what source material was provided for translation and editing.